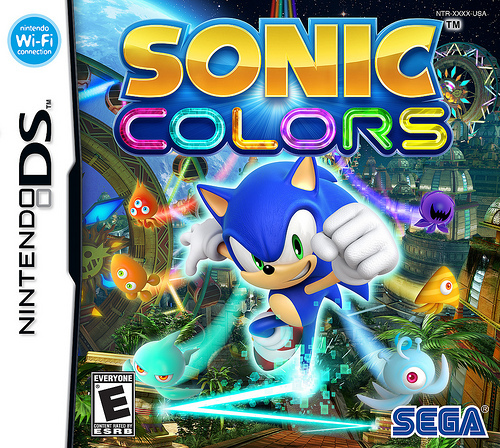 Who’s excited for Sonic Colors? I’m excited. How excited? Real excited! Today Sega has revealed the box art for the DS and Wii versions, the release date for the games and a new trailer. You can see the Wii version’s cover in their post, though it’s exactly the same. In the new trailer we get an extended version of the song from the first trailer and lots of fantastic looking gameplay footage. The article also reminds us of the hat pre-order bonus that you can pick up on the new release day of November 16, 2010. I pre-ordered both versions of the game, and you know what that means (TWO HATS!). “I’m gonna reach for the stars, although they move pretty far” The song grew on me but that one part makes me scratch my head. Anyway, still optimistic about this and Sweet Mountain is still looking to be my favorite zone. Heh, for a second I thought the lower right hand corner said that the song was “featuring Jean Paul Makhlouf from Cash Cab”. I would love it if the host of Cash Cab recorded a song for Sonic Colors. He’s so charming. The team that does the CG for Sonic Team is still quite good. I’ve been kind of in love with the song since the first trailer. I hope those guys do more on the soundtrack.